Welcome to marquee hire Wiltshire by Oakleaf Marquees, your perfect partner for any event needing shelter both large and small. Oakleaf Marquees have been supplying marquees and accessories to events across Wiltshire since 2010. We have visited countless private homes and farms plus venues such as The Wardrobe in Salisbury Cathedral Close, Calne's Atwell-Wilson Motor Museum, Trafalgar Park and more intimate venues like Tisbury's Ashley Wood Farm. We've built marquees over rivers, walls, flowerbeds and trees. 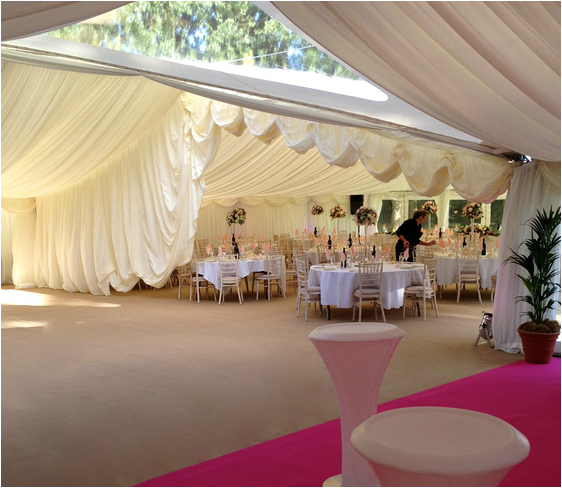 We always like a challenge and offer one of the most flexible yet professional marquee hire wiltshire services around! Our marquee hire wiltshire range is one of the widest in the South encompassing not only different marquees but also linings, furniture, dance floors, generators, luxury toilets, lighting and decoration to enhance them. Just browse our Accessories page and the Gallery too to get a feel for what we can do for you. We're confident you'll quickly realise what sets Oakleaf Marquees apart from the rest. Please Contact us for an informal chat, quotation, layout plan or to arrange a site visit within Wiltshire. Site visits are free and without obligation on your part. At the visit we'll take a look at the site you propose, discuss your vision and the layout before going through the options. We'll also take time to recommend other suppliers we've worked with in the past and can recommend. Catering staff applying the finishing touches to a wedding marquee in Calne, Wiltshire. See more pictures in our extensive Gallery and Marquee Hire Portfolio.